Meet the Oraon tribe who call themselves Kurukh, by the name taken from their hero-king Karakh. 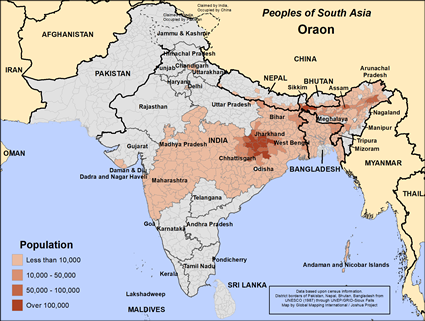 The Oraon used to live south-west of the river Ganga but are now mainly concentrated in Chhotanagpur in Bihar and the adjoining areas of Madhya Pradesh, Orissa, West Bengal, Tripura, Maharashtra and Assam. 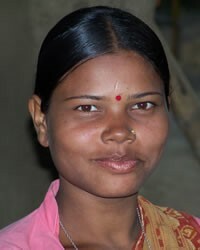 They speak languages such as Kurukh, Sadri and Hindi which are from the Dravidian family of languages. They write using the Devanagari script. In stature they are short or below medium in height. They are mainly settled cultivators and also work as wage labourers and industrial workers. Their staple cereal is rice, supplemented with maize, wheat, Madua and Gondli. Both men and women consume alcohol, and they also prepare rice beer at home. Generally men chew tobacco and women smoke the Hookah. The Oraon have their traditional community council at the village level headed by a Mahto. They have a regional council known as the Parha composed of a number of villages. Their main deity is taken as Dharmes, and they also believe in a host of spirits. A priest is invited to perform their life cycle rituals. An Ojiha or mati is specially called to cure diseases by appeasing evil spirits. * For the salvation of the Oraon people; that the disciples of Jesus among them may spread the good news of God to others. * For them to seek Jesus for healing from their sicknesses rather than using methods of witchcraft. * For the Oraon men and women to be freed from alcohol and tobacco addiction.View Oraon, Kurux in all countries.